A brief Summary of his life. Jean-Paul Jérôme was born in Montreal on February 19, 1928 and, well before he entered grade school, the native gifts that were to sustain his deep and lifelong commitment to drawing and painting were already made obvious. Then, after a short period of time during which he dedicated himself to landscapes and still lives, mostly after the cubist way, in as early as 1953, he shifted towards abstract painting, letting large swaths of evenly brushed paint drift on his canvas. His approach to art thus evolved more and more out of geometrical concepts, the reproductive outcome of which prompted his creation towards ambiances brought about by an absolute formal mastery. From 1956 to 1958, in order to further his creativity, he lives in Paris, where he meets Giacometti and Vasarelly and share with René Mortensen a common passion for achieving a perfect harmony between shapes and colours. 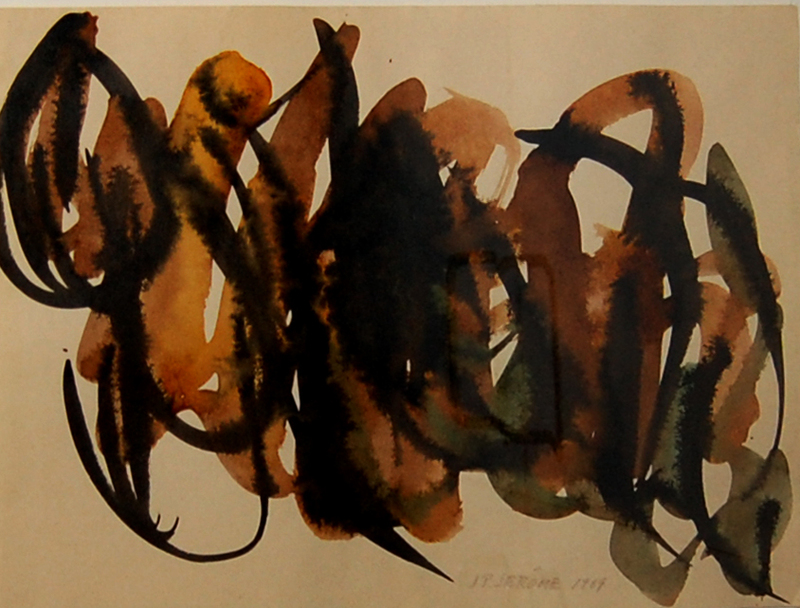 He also make friends with sculptor Gilioli and Hans Hartung and associates with Martin Barré’S studio while attending on a regular basis Galerie de France’s and Galerie Arnaud’s artistic dealings and exhibitions, beside having his own paintings exhibited at the latter Galery in the fall of 1957. After he returned to Canada in November 1958, he was admitted as a teacher by the Montreal School of Fines Arts and by the Montreal and Sorel school boards, where students also benefitted from his art, knowledge and craftsmanship. In 1973, he quits teaching and devotes himself entirely to his art, following a creative urge that compels him to house his studio in the south shore countryside of the St- Laurence river, in St-Ours sur le Richelieu, St-Laurent du Fleuve, St-Roch and Varennes, among others. Three years later, without giving up the lyricism of those open spaces, he buys the family home to provide steadier quarters for himself and he converts one of the floors into a loft totally dedicated to his work, where everything is conductive to creation, a studio to which a second on will be added, The Sunny Den, as the painter will name it, a workshop to give him the opportunity to raise his expertise to higher levels still and increase the span and scope of his paintings. From then on, his paintings stand out among those experts and collectors, whether insiders or from the general public, are fond of, some of them- with the certainty of a warm welcome, as it was the Jean-Paul Jérôme’s native way- coming to pay regular visits to his studio, which was open to them seven days a week, from seven in the morning to four in the afternoon. In 1978, the Royal Canadian Arts Academy honours him by admitting him as a member, in recognition of his outstanding contribution to the arts and the underscore the great significance of the whole of his works. Jean-Paul Jérôme has over a hundred exhibitions, either solo or collective, to his credit, in galleries and museums throughout the country. His works are also included into numerous Canadian private and public collections, whereas reports on his works have been the topic of several reviews. In 2003, the Musée du Bas Saint-Laurent paid him a warm tribute as they displayed a retrospective exhibition of his paintings, the whole of which, in the course of the next four years, was presented throughout Canada at large. In 2005, the Musée des Beaux Arts de Sherbrooke devoted an outstanding retrospective to the Plasticiens, to celebrate the fiftieth anniversary of their Manifesto, thus bringing out the main stages of Jean-Paul Jérôme’s works. But he could not attend this celebration since he died in his seventy-sixth year, on August 14, 2004. But he is outlived by his works for the stand above time. A forceful and keen painter, he dedicated his entire life, up to the very last moments, to painting: “Enraptured by live” was the title he gave to his last painting, a prophetic work that sums up the whole of his works. For, moved by both a deep passion and a steadfast commitment to his Plasticiens’ initial guidelines, Jean-Paul Jérôme was able to express himself through a variety of materials and the embody his art and sensibility in the most diverse manner: his oil and acrylic paintings rest on wood , glass, pottery, tapestry and stained-glass as well as on art papers and cardboards, among numerous other media, where he could give vent to a vast array of pastel, charcoal, red chalk and sepia drawings that ranged well beyond already high standards of his own. His sculptures, on brass or on wood, his reliefs and his monumental concrete architectural structures proudly match his easel- and worktable-size paintings since his mastery of the most subtle processes underlying their completion was, first and foremost, rooted into the art of drawing, an art that enabled him to achieve balanced displays of shapes on his canvas, as he managed to imbue his workshop with music, reading and writing. So much so that he left us writings of his own, in which he took pleasure to define his art and tell apart the different stages of his creation. Before passing away, Jean-Paul Jérôme mandated the administrators of his works to care for the lasting quality of a collection in which the musical spell of colourful shapes ceaselessly brings forward in their midst such beauty that each is a joy forever. This entry was posted in Biographies, Jean-Paul Jérôme and tagged jean-paul jérome, jp jerome, plasticiens by lacorniche. Bookmark the permalink.